Caring for vulnerable people and patients means constantly being aware of their needs, and this can often encroach on their privacy and independence. With the Geemarc Amplicall 2 Push Bell with Emergency Cord, it is possible to leave patients unattended while also providing them with the ability to call for help should they require assistance. The Amplicall 2 has a simple yet effective design to allow for quick and easy activation. It features a single alarm button that offers an easy push activation. This is ideal for when the push bell has bee positioned at a height, such as beside a bed or a chair. 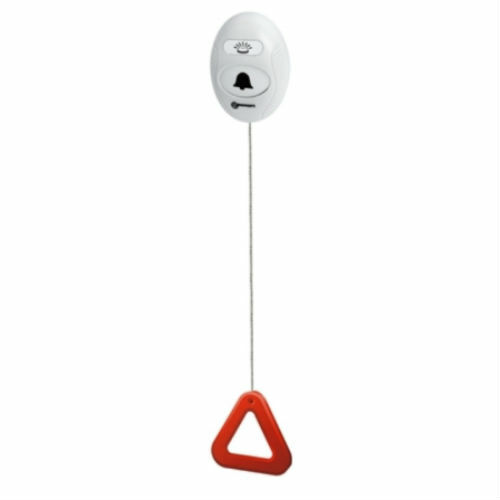 When connected to a wireless alerter, the activated push bell will signal to the carer that assistance is required. The inclusion of the emergency cord enables the push bell to be used in various different situations. The long cord will be ideal for using it in a bathroom where assistance is sought following a shower or bath, allowing the patient to pull the dangling cord without needing to climb out of the bath to push the button. When positioned lower to the ground, it is also practical for anybody prone to falls, providing them with an easy pull alarm system that will call for help. The Amplicall 2 Push Bell with Emergency Cord can be connected to wireless alerters, which can in turn be placed around the home or worn by carers. These alerters will then indicate to the carer that the push button or cord has been activated, providing them with instant information that help is required.